A video (below) of a California recycling truck driver giving a toy to a 5-year-old boy with autism is touching hearts across the Internet. 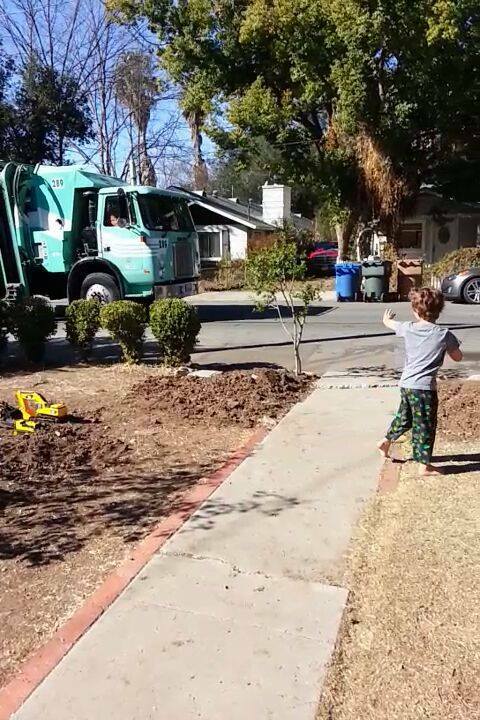 In the video, a boy named Daniel Mulligan runs down the path from his Southern California home to greet the recycling truck that has arrived. He waves his hands rhythmically, matching the sounds and movements of the truck. Daniel’s mother posted the video on Facebook and it has been shared over 65,000 thousand times. News stations in the United States and as far away as Japan and Australia have picked up the clip. Robin goes onto explain that when she showed Daniel a video clip of a garbage truck on YouTube, he became obsessed and started waiting for the trucks to pull up in front of his house every Monday morning on trash day. Daniel’s favorite truck driver on trash morning is Manuel and over time the boy developed a relationship with him. “[Manuel] always has a big smile for Daniel, who is faithfully waiting for him every Monday,” Robin writes. Manuel drives for E.J. Harrison & Sons and the Ventura-based company recognized his thoughtful gesture with a restaurant gift certificate. He’ll also be featured in the next company newsletter. “He noticed this boy waiting for him every Monday morning and he bought him that toy truck with his own money,” she added. Drake says children are enamored with garbage trucks and when she posted the video clip of Manuel on the company Facebook page, parents wrote in saying that their children love waving to the drivers.